2.1 What is Dust and Why does it Affect us? Every year, thousands of construction workers contract and/ or die due to working with dust particles and related respiratory diseases. This includes around 13,000 deaths a year from lung disease, with an increase of over 40% new cancer-related construction deaths. If one is lucky enough not to die, they must live with the life-changing suffering of the respiratory disease. One of which could have been prevented if their companies had taken the liberty of taking safety precautions. This article is here to inform you on the ways you and your employer can prevent disease. This is not only for your benefit but the surrounding areas as well. The controlling and managing of dust exposure has always been a challenge for the industry. This is due to the nature of construction projects and the materials used to do so. But, with companies being so relaxed about the situation, an estimated 500 construction workers die from silica dust exposure every year. With such a high number, there are 23.5 million working days lost in the UK due illness. One of the main issues is that a number of dust particles being breathed in each day at work seem small and insignificant. Effects of exposure may show immediately, but most likely, the respiratory risks are usually overlooked, misunderstood, and become apparent years down the line. The diseases that form can cause some discomfort or become completely disabling. What is Dust and Why does it Affect us? Dust is a very broad term for solid particles floating in the air. The larger particles tend to settle, but the smaller particles stay suspended in the air. These are the real health threat as they may be small enough to penetrate the lungs and migrate into the respiratory system. These specific particles are normally under 10 microns in size. Because they are so small, they bypass the body’s cleaning mechanisms (cilia and mucous) and then become trapped in the upper respiratory tract. One of the lesser hazards caused by dust particles would be asthma. This not only is a threat to workers but also to the surrounding community. Another airborne dust hazard could be histoplasmosis. This being an infectious disease caused by inhaling spores of fungus in which can be found in bird and bat droppings. It is important to look out for symptoms such as chest pain, fever, loss of appetite, joint and muscle pains, chills and more. If symptoms are missed or misjudged, disseminated histoplasmosis could be fatal. Another fatal condition possible with construction dust hazards is chronic silicosis. This happens when a worker is exposed to crystalline silica. The issue is that the disease can remain undetected for years and become cumulative. Symptoms to watch for are a cough, weakness, and shortness of breath. If left untreated, the suspect may develop tuberculosis. With this, the worker will experience chest pains, a respiratory failure which can be linked to lung cancer and kidney disease. Obviously, the fate of the workers is incredibly important. 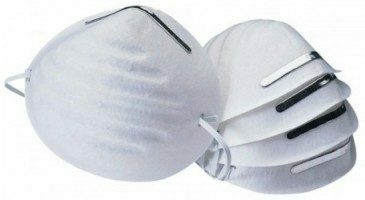 It is vital that both employers and employees take the proper steps to avoid the chances of respiratory diseases through dust exposure. This can be done in some ways. First, Employers must assess the risks of the job. Naturally, the more enclosed the area, the longer the work and the more energy required will all increase the risks. This can be handled by using different materials, tools, using water suppression, wearing masks and having the proper training. It is also important for workers to work under the correct controls and be aware of their situation. By taking the proper precautions, this will help keep both the workers and the company safe. The health of the worker is important as is the reputation of the establishment. By maintaining safe working measures and happy workforces, your business can be a bigger success. We have created a working with dust cscs mock test for you to take and test if you have the knowledge needed. More Revision Material can be found here.